☆ Measures 6-1/2" x 9-1/2" x 1-3/8"
* Accessories displayed in photos are not included. 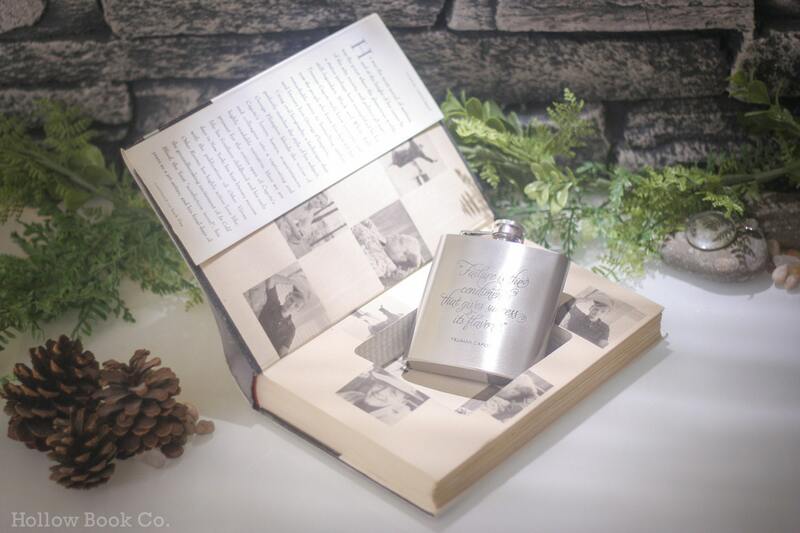 Friends and family love the hollow book with our 6oz hip flask. 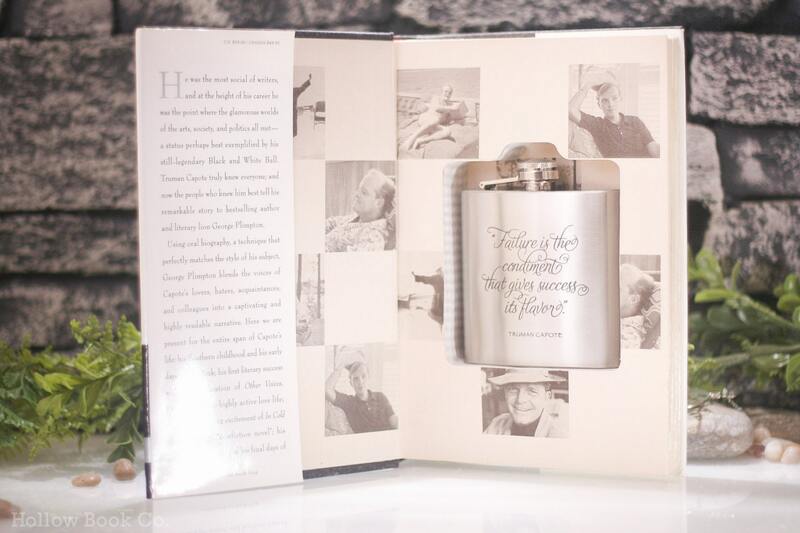 You can personalized your flask with a laser engraved monogram or customize your flask with your favorite Truman Capote quote. 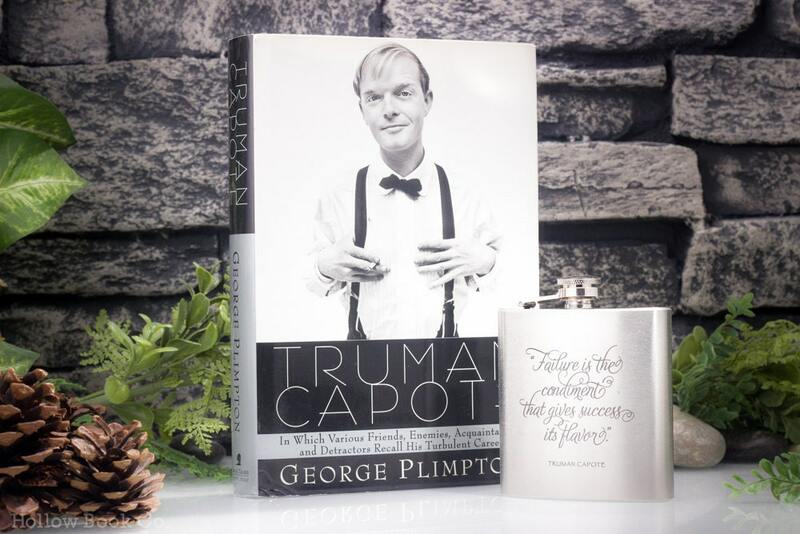 The Truman Capote hollow book and flask is inspiringly cool and stylish, for formal and casual social occasions. 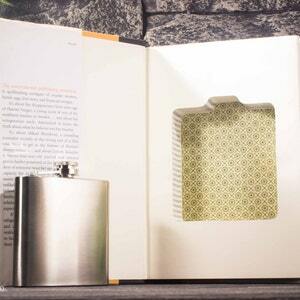 A unique gift that makes a big impression, with a magnetic connection–your book will keep a tight grip, so you do not have to. HollowBookCo ships USPS from New York City. Tax is applied to orders shipped to NY. Customs within European Union may require VAT on imported goods. Please allow 1-3 business days to process before shipping. • Tracking is available in select areas. Allow additional delivery time for orders shipped during the holidays. Once packages leaves our facilities, USPS is responsible for the shipments. Ensure your address is correct before shipping. Incorrect shipping addresses may be returned back to sender. within 14 days after receiving your order with any issues regarding your order. Custom orders are ineligible for refunds. Make certain your order is correct. Custom and large orders (5+) are not eligible to receive a refund. 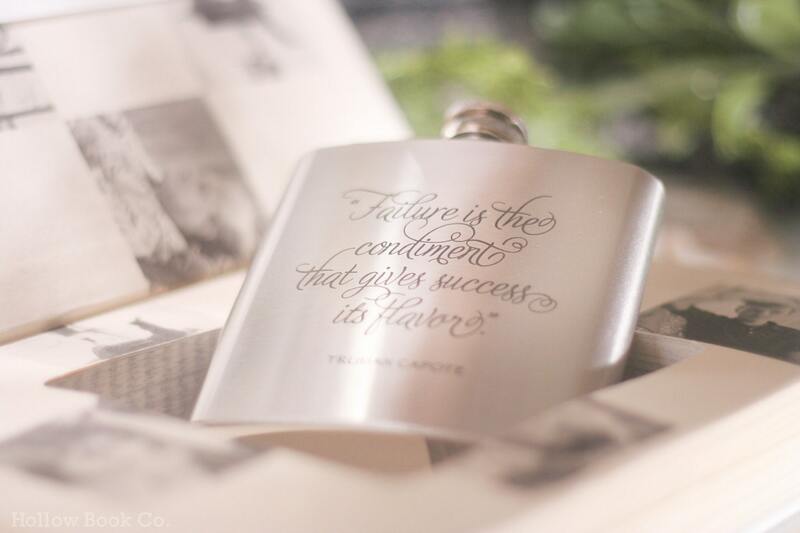 To the original purchaser that your flask is guaranteed to be free of defects in materials and workmanship, so that it will be repaired or replaced. It does not cover damage caused by misuse, accidents, ordinary wear and tear, or alterations to the product. We are not responsible for any incidental or consequential damage. 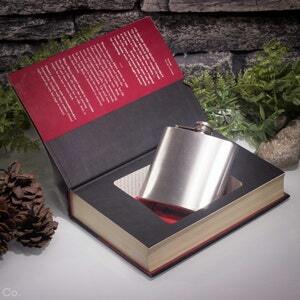 However if you do experience any defective issues with your flask, please let us know and send us pictures so we can hopefully try and prevent or correct future problems. 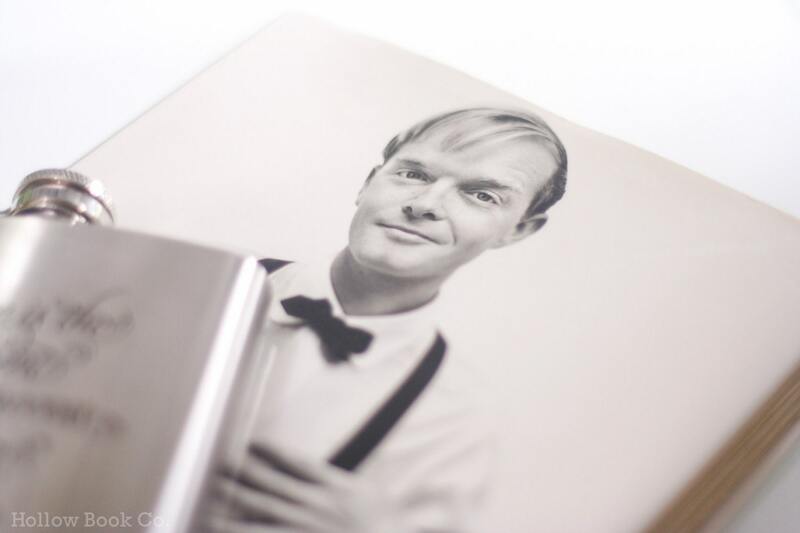 We repurpose books with a magnetic closure—We take special care to use archival museum-quality, acid-free adhesives to avoid yellowing and brittleness from aging. We do our best to conserve and restore books, and maintain 'good', 'very good' to 'like new' conditions. Any notable imperfections will be noted within the listing. 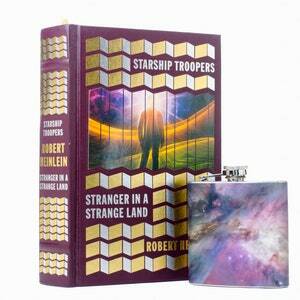 Please leave your name, message, or initials in the 'notes' when purchasing your book(s). It will not extend the 1-3 business day processing time we need to ship your order. We will send back a preview for your approval within the 1-3 day process before going to print. If we do not hear back from you regarding your preview, we'll ship your item to avoid delays with your order. If you require any exceptions, you can contact us. Select 'custom engraving' and add your message to 'notes' at purchase, and we'll take care of it from there. Make any design suggestions, ask for a script, serif, or san-serif block lettering if you'd like or just have us make your selection. We may send back a preview sample, so please keep your ears open for any convos about your order. Did we run out of a book? 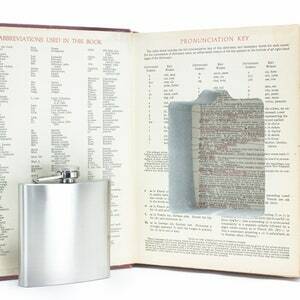 Want a full cut book safe instead of one with a flask? Convo us to check on stock, we may be able to accommodate your needs. Let us know when you need your order, and we'll check on the status of getting it to you in time. Unfortunately we are unable to schedule local pick ups. We get asked this a bunch, but in respect for our neighbors we are unable to do so. For those needing a last minute, rushed gift... Deliveries within NYC (Brooklyn, Queens, Manhattan, Bronx and Staten Island) normally move approximately a day faster. Shipping Priority Mail (1-3 business days) to guarantee speedier service without the need for your own transportation and time. Use tracking to ensure its timely arrival.